Two stunning whites within a week. 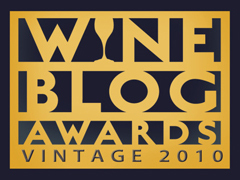 Among the many things this wine blogging experience has taught me is a greater appreciation of white wines. There are those wine drinkers who claim, with some degree of self-congratulations, that they only drink red. In my view they are missing out on some truly exceptional wine experiences. This is one of them. His 45 or so amphorae have been imported from Georgia, one of the few places to still have the technology to fire such massive pots, a technology that supplied winemakers in Roman times. Fermentation and extended maceration of the ribolla grapes (an ancient, little-known varietal that Gravner has taken pains to re-establish) takes place for several months in the amphorae. The long exposure to the skins gives rise to the wine’s deep, rich colour. Eventually the wine is transferred into large wooden barrels for aging, then is further aged in the bottles before release. Gravner takes what he terms a “natural” approach to his winemaking. Organic cultivation of the grapes, followed by fermentation with indigenous, wild yeasts only, and without temperature control. The wines are bottled unfiltered. Gravner’s approach was initially met with considerable skepticism. Many in the business of wine rejected it, noting the fact that Gravner’s wines made from his previous methods were highly acclaimed. Wasn’t he the “King of Italian Whites”? Why tinker with success? In Gravner’s mind, he did so because there was a purer, more interesting, more natural and healthy alternative, one that returned to ancient methodology. He would be the first to admit that his wines lack broad appeal in the technology-driven world of modern winemaking. But, so be it. His wines have found their admirers, their strong advocates who seek out something very special, and have found it in the world of Gravner wines. A wine for an uncommon setting. A wine to share with adventuresome friends who appreciate diversity in the wines brought to their table. I knew we were in for something different when I took the wine from the rack earlier in the day and eyed a distinct pinkish sediment along the length of the bottle. Or when the wine pouring into the glasses turned out to be the colour of overripe strawberries, and noticeably cloudy. I had the feeling that ‘polished’ or ‘finessed’ were not about to surface in our search for words to describe this vino, one purchased from the natural wine-loving folks at Artisan and Vine in London a couple of months ago. Ascend we do into uncharted territory, where grape-life is in flux, where rules have not yet evolved. There is a raw, unstructured intensity, a primal quality that most (but not all) of us find appealing. Yes, of course, there is fruit (wild cherry, wild raspberries) but seemingly a comparable number of vegetal and animal notes. Good acidity and workmanlike tannins. Rustic fruit, alive in the glass. What the earth has offered up has been left in its basic state, left to its own devices, to develop in whatever direction comes naturally to it. And the result? I suspect we are encountering one of a series of results, that with each vintage the wine takes on a life of its own, that one year could be very different from the next. The winemaker’s aim is not consistency, rather full expression of the variables in play year to year. Frank Cornelissen works 8.5 hectares of vines in the North Valley of Mount Etna in Sicily. Belgian in background, Cornelissen came to the region of the famous volcano in 2001. He set himself on a unique path — some would say an extreme path — where nature rather than the winemaker dictates the qualities of the wine produced. No intervention, no treatments of any kind, No sulphur, no copper, no manure or compost. Wines, he would say, as nature intended. The vines are free-standing, without wire or other supports, in what is called the “gobelet” or “bush vines” style of vine training. The estate balances the vines with olive, fruit and nut trees, as well as plantings between the vines, such as buckwheat. Bees form an integral part of the vineyard ecosystem. Harvest is in October and November. Only heathy grapes at prime ripeness are gathered. Fermentation begins outdoors in 1000-litre polyethylene tubs, and eventually the wine is transferred to the cellar and into terracotta amphorae (or “giarre”) which have been buried to their necks in ground volcanic ash. Masceration takes place over several months, before basket-pressing removes the skin and seeds. Aging continues in the amphorae “until several full cosmic cycles have passed.” It’s another year or more before the wine is ready for its gentle transfer into see-through bottles with their see-through labels. Here in his cellar Frank Cornelissen sits, his amphorae behind him. Transparent wine rebel? Unconventional, idiosyncratic viticulturalist? Certainly a wineman to stir things up. The wine world needs more like him. This is the start of a month of new drinking terroirs. I am headed to Languedoc & Roussillon in France, to explore. That would include its food, and, of course, its wines. But first, a day in London en route. An afternoon of research for a current project leads on to a recently opened wine bar and restaurant, one that I’ve been reading very good things about online — http://www.artisanandvine.com — Artisan & Vine at 126 St. John’s Hill, Battersea. Its wine list is thoroughly organic and natural. As it turns out, so are the people working there when we arrive. And delightfully engaging. Suvi, Oli, Marie, and Karlee — thanks everyone; we loved our evening! 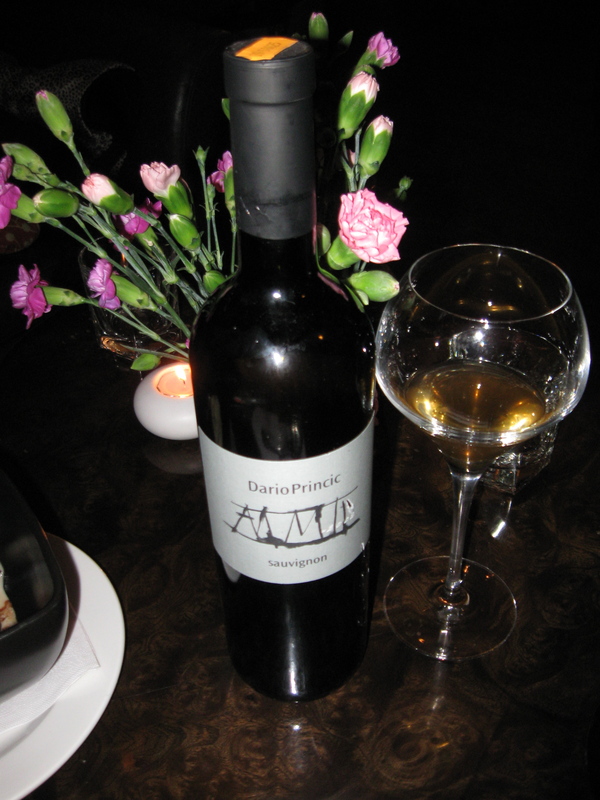 Most memorable is a wine of Dario Princic. Neither white nor red, but what is sometimes called an ‘orange’ wine, its colour originating from the fact that the skins of its sauvignon blanc grapes have been left to add to the wine’s colour and structure during maceration, rather than being removed, as is the case in the making of most white wines. Pigment and tannin, which most white wine-makers would be at pains to avoid, are there for your drinking pleasure. Naturally interesting. And orange, as you see. Or in Italian ramato, copper-coloured. It goes particularly well with the scallops which the chef prepares just behind where we are sitting, our location having the advantage of being able to toss bits of conversation back and forth as he works (including our cross-Atlantic experiences of lobster). 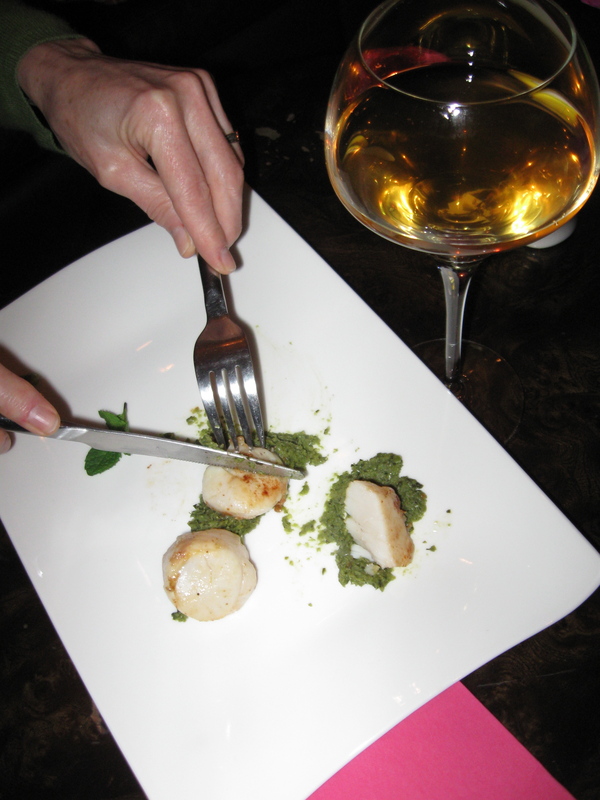 The seared scallops are resting on a pesto-like bed of mint and green pea. Delicious, absolutely. Equally so the lamb cutlet and tuna entrées that follow. Oh, and we mustn’t forget the brilliant chocolate brownie with warm chocolate sauce. Artisan & Vine thoroughly won us over. Return visit planned on the way back home. Dario Princic makes his wines near the town of Oslavia in north-eastern Italy, very close to the border with Slovenia. Here limestone predominates. The dry winds are an aid to organic viniculture, which Princic has been practicing for more than twenty years. An individualist, it goes without saying, from his production of unfashionable ‘orange’ wine to their Motherwell-like labels. 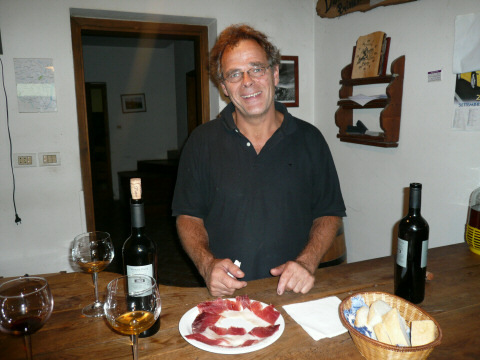 He is one of the founding members of Vini Veri, an association of Italian natural wine producers. The man obviously relishes his wine-making, and the culinary pleasures that accompany it.